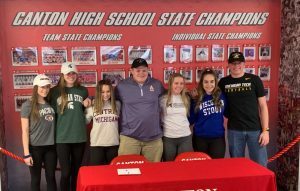 This is a reminder that you and your coaches have been invited to participate in national signing day on February 6th, 2019 (4:00pm) @ Canton High School. Please let Mr. Crump know if you plan to sign a national letter of intent to participate in collegiate athletics for 2019-2020. Signees are encouraged to bring their coaches, families, college coaches, etc. In addition, if you have a t-shirt or hat that represents your chosen university, you are welcome to wear it. Bring your actual letter of intent if you will be signing on that day (a fax machine will be on hand for those that need to send their letter immediately). Students who have signed already or will be signing later in the year may use a staged letter of intent. Please contact me ASAP if you plan to attend. We will be making a pamphlet with everyone’s names on it and don’t want to leave you out. Thanks for your participation!